Morning sickness is defined as the nausea during pregnancy, most commonly during first trimester. So, when you’re pregnant, the body will produce a certain hormone known as Human Chorionic Gonadotrophin (HCG) in large amounts. This hormone is mainly responsible for nausea and thereby morning sickness. Apart from this, other hormonal changes, stress, strong fowl smells and odor, low blood sugar, constipation, vitamin and nutritional deficiency, anxiety, etc. can lead to morning sickness. Always remember that nausea with or without vomiting is a symptom of morning sickness. To understand better about morning sickness, you have to know in detail about nausea. Nausea is defined as a feeling of unease and discomfort that caused in the upper stomach characterized by an urge to vomit. This nausea is caused due to many reasons and the people with nausea may or may not have vomiting. Before starting this post, you have to remember that morning sickness is not only caused in the morning but this sickness will start in morning and continue throughout the day. Visiting gynecologist every time whenever you suffer from nausea is not a possible thing, also the over the counter medications can trigger the morning sickness. So the best thing is to follow the home remedies for treating nausea and morning sickness at home. There are many home remedies for treating morning sickness. Hence I know that you will get a doubt that, why this post is covering only ginger for morning sickness, as there are many home remedies. Here we clarify your doubt. Ginger is a strong flavored root that comes from tropical zingiber officinale plant which is widely used in medicine (In Indian Ayurveda, Chinese Traditional Medicines and in all ancient medicines) and cooking to prevent many health related problems. Ginger is considered as the classic nausea reliever. The recommended dosage of ginger will be not more than 2 gms or 2 teaspoons per day. Here are some effective ginger properties that help to clear the morning sickness and give you an idea that why using ginger more widely in treating morning sickness than other remedies. Ginger has certain chemicals known as gingerols and shogaols that helps a lot in giving relief from nausea, vomiting and thereby morning sickness. This promotes the secretion of various digestive enzymes which help to neutralize the stomach acids and thus helps for better digestion. It has phenols that help to relax the stomach muscles that reduce the over activity of stomach acid by clearing the bad stuff to pass faster from it. This is especially used for the women those who suffer from morning sickness due to indigestion. It acts as stomach soother that helps to relieve the nausea or morning sickness symptoms and makes you feel free from these stomach related problems by soothing the stomach. It has one of the active compounds called 6 – gingerol that helps to relax gastro-intestinal muscles and thus helps to ease not only morning sickness but also seasickness and other forms of queasiness. 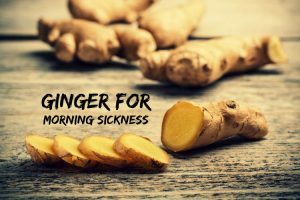 After knowing about ginger, want to know how to use this ginger for treating morning sickness. Then scroll down to get some effective ginger methods which you have to follow them regularly to get complete relief from nausea and morning sickness. Take fresh ginger root and wash it off properly. Peel it off the outer skin and grate it thoroughly with the help of grater. Then pour water in a pan and place it on the stove over medium heat. Now add this grated ginger into this water. Allow it to boil for few minutes until the water has reduced to half. Turn off the stove and keep it aside to get cool for few minutes. Add honey in it and stir it well. End the process by drinking this in the morning to get rid of morning sickness. Daily intake of this ginger decoction will give relief from morning sickness. Ginger tea will act as an excellent repulse of nausea and morning sickness. It has rich source of vitamins like B, C and D and minerals like calcium, magnesium, potassium, zinc, copper, etc. which makes it as an effective drink for pregnant women to treat their nausea problem. Hence the regular consumption will definitely help to minimize this sickness to a great extent. Take powdered ginger and add this to boiling water. Stir it and allow it to steep for about 10 minutes. Then strain the tea into another cup by using strainer (as per your wish or drink like that). Sip this ginger tea slowly to keep this morning sickness at bay. Regularize the intake of this ginger tea to get relieve yourself from the morning sickness problem. But always remember that the pregnant women should not consume this ginger for more than thrice a day to prevent the side effect caused by it. Take a small piece of ginger and wash it off properly. Peel it off the skin and cut it into small pieces. Then start chewing these ginger pieces slowly throughout the day to get rid of morning sickness. Or you can chew ginger candies or lozenges or any other forms of ginger to get instant relief from nausea and thereby morning sickness. Follow this process regularly to prevent morning sickness problem. Take ginger powder in a small and clean bowl. Then add equal quantities of freshly extracted lemon juice, fresh mint juice and raw honey in it. Combine all the ingredients well to make it fine mixture. Drink this mixture to relieve from morning sickness. Regular intake of this mixture for twice a day, preferably once in the morning and once in the evening will help to keep this nausea or morning sickness at bay. Drinking ginger herbal tea will help to hydrate and provide all the assimilated nutrients to the body during pregnancy. It has anti-oxidants that help to lower the anxiety and stress levels in the body. Daily drinking of this tea will help to prepare uterus for labor. Take fresh ginger root which is washed and peeled. Cut it into small pieces or better crush them finely. Then take a tea pan and pour water in it and place it on the stove over medium heat. Boil it for few minutes and then add crushed or chopped ginger in it. Allow it to boil for another 5 – 7 minutes. Now remove the heat and strain the tea (or leave it like that) into other cup / tea mug. Add raw honey or lemon juice to enhance the ginger tea taste and sip it slowly to get relax yourself without any morning sickness. Repeat the same process of drinking this ginger tea once or twice daily to get rid of not only from morning sickness but also from motion, sea and altitude sickness. Ginger ale is one of the effective methods for calming the gastro-intestinal tract and thereby eases the morning sickness. One important thing to remember while using this ginger ale for treating nausea is to check whether it contains real ginger or any artificial ginger flavor. Make sure to drink the ale which is prepared by pure ginger. First of all, take saucepan and add chopped ginger, lemon peel in it. Then add water in it and place it on the stove over high heat. Allow it to boil for few minutes until it comes to boiling point. Now simmer it for about 10 – 15 minutes without covering. In the meanwhile, you have to add sugar and stir it well. Whenever you find that sugar has dissolved completely and the mixture in the pan reduced to 3 cups, which might take around 15 – 20 minutes. Then turn off the heat and strain this mixture into a large bowl. Finally pour this in a glass container to store this ale properly and allow it to cool down for about a week. Mix 1 cup of cold club soda in 1/4 cup of this ginger ale syrup and drink this by adding ice cubes and other flavorings to enhance its taste. Regular intake of this ginger ale will help you a lot in curing the morning sickness. You can have this tea either hot or chilled and you can also carry this tea while you’re travelling by boat, car or airplane to get rid of nausea and morning sickness along with motion sickness, sea sickness, altitude sickness. Drink this tea at any time to prevent nausea. Begin the process by taking a tea pan and pour water in it. Place this on stove over medium heat. Add grated ginger and lemongrass in it and stir it well. Allow it to simmer for about 10 – 15 minutes. Then turn off the heat and add herbal tea powder in it. Wait for 2 – 3 minutes and strain the tea into a cup. Now add organic honey and freshly squeezed lemon juice or lemon slices in tea to enhance its taste. Sip it slowly to get complete relief from the morning sickness and also helps you to have proper digestion. Regular intake of this ginger – lemongrass flavored tea will yield best results over morning sickness. Make sure that pregnant women should not take this lemongrass in excess. So be sure that not to have this daily. Take freshly taken ginger juice and pour it in a small bowl. Add honey to it and stir it well. Consume this ginger juice mixed honey slowly in the morning after you wake up. Regular consumption of this mixture will help you to get relief from morning sickness and also gives additional health benefits. Start the process by taking 6 – quart pan and place it on the stove over medium high heat. Then add butter and onions in it and stir it occasionally till the onions are limp. Now add broth, carrots and grated ginger in it. Cover it and allow it to boil for few minutes. Reduce the heat and place it in simmer till these carrots become tender when pierced. Turn off the heat and shift this mixture to blender and blend it thoroughly to make it like puree. Then place the pan again on the stove and add cream in it. Pour this smooth puree in this pan and boil it for few minutes by adding sufficient amount of salt and pepper in it. Have this soup by garnishing it with fresh parsley springs, dollop sour cream over it. Regular intake of this ginger – carrot soup will definitely help you to clear the morning sickness and also gives the essential nutrients to both of you (you and your baby). First of all, preheat the oven to 350˚F. Line baking sheets with non-stick silicon baking mats and set aside. Take a mixing bowl and combine the flour, cinnamon, baking soda, ginger, cloves and salt in it. Then place butter in a bowl of standing electric mixer that is fitted with paddle. Now begin beating process on low speed to soften the mixture. Increase its speed slowly to medium and continue beating for 3 minutes or till you get light and creamy mixture. Add granulated sugar and dark brown sugar in it and beat it for another 2 minutes. Add egg in it by reducing the speed a little low and beat it. Use a rubber spatula to scrap down the sides of the bowl. Pour vinegar and beat it slowly in reserved dry mixture. When all these dough is blended then you can remove the mixing bowl from mixer and scrape the paddle clean. Roll this dough into small ball of about 1 inch diameter and coat each ball in sugar. Place all these balls in prepared baking sheets with a distance of 2 inches. After placing all these cookies in that sheet, then place this in the oven. Bake it for about 12 minutes or more till it get light colored. Finally remove it from the oven either by using metal spatula or spoon and place it another plate to get cool for few minutes. Store this in an airtight container to stay fresh for up to a week without spoiling. Have this ginger snaps regularly throughout the day to get rid of morning sickness. This ginger lemonade is also effective drink for treating morning sickness, all you have to do is to prepare this drink at home in a large jug and keep it in refrigerator. Sip it slowly throughout the day to ease queasiness and other morning sickness symptoms. Take a large saucepan and add ginger slices, water and sugar. Mix it well and place it on the stove over medium heat. Heat it for few minutes to get boil by stirring it occasionally. Turn off the heat and add lemon juice in it. Allow it cool for about 15 – 20 minutes. Then pour this in a jug and refrigerate it for about an hour. After that, drink this by pouring some ice in it and garnish it with lemon slices. Have this ginger – lemonade regularly to get complete relief from the morning sickness and its symptoms. Ginger is termed as a great remedy for treating nausea and morning sickness. Ginger in the form of ginger biscuits will help a lot in curing the sickness without any side effects, but one thing you have to remember that not to consume them more in number, as they contain more of sugar content that might cause harm to the body. First of all, preheat the oven to 180˚C. Melt the butter in pan thoroughly and pour all the ingredients in a mixing bowl except butter and golden syrup. Then pour butter and the syrup in the bowl and mix it well. For more effective results, mix this with a dessert spoon and take out the mixture in a spoon full. Wash your hands and pat dry the skin. Place this roll onto the hand and press in down gently in the middle, as it should be 5 to 6 cm. Finally, place these rolls on the greased non-stick baking trays. But make sure that you have to leave a lot of space between the rolls as they spread while baking. Bake it in a preheated oven until they reached golden for about 10 – 12 minutes. After that take it out and allow it to cool down for another few minutes. Pour all these biscuits in an airtight container and eat them to prevent morning sickness. Continue consuming these effective ginger biscuits throughout the day to get complete relief from morning sickness. Begin the process by preheating the oven to 180˚C. Take a mixing bowl and add ground ginger, baking powder and cinnamon in it. Take out an egg and beat it properly. Pour this in a bowl and keep it aside. Then take a saucepan and pour margarine, sugar and golden syrup in it and place it on the stove over low heat. Stir it occasionally till all these ingredients are melted properly for few minutes. Now pour all these ingredients into the mixing bowl (which you kept aside) and mix it properly. Let it sit for few minutes to get cool down. In the meanwhile, you have to prepare a large baking tray by using greaseproof paper to line the tray. Then roll a teaspoon of this fine mixture into small balls and place this on the greaseproof paper. Start baking this in the oven near the top for about 15 minutes and take it out. Leave the baking tray like that for few minutes and place it on a wire rack to get cool down properly. Store this in an airtight container and have this to get rid of morning sickness. Regular consumption of these ginger cookies will help you to get complete relief from the nausea and vomiting in pregnancy. Take a mixing bowl and add butter and dark brown sugar and caster sugar in it. Then add egg, ginger powder and thereby flour and salt in it. Mix it thoroughly and add chopped ginger pieces in this biscuit dough. Roll the dough into balls and lay it on one side into caster sugar. Now press it gently into a greased biscuit tray. Finally bake it at 180˚C / Gas 4 for about 10 – 15 minutes or more till you get golden brown biscuits. Take it out and allow it to cool for few minutes. To get more effective relief from morning sickness, you have to consume this biscuits throughout the day. Take grated ginger and place it in a cup. Then pour boiling water over the ginger pieces. Allow it to steep for about 15 – 20 minutes. Now drink the tea with grated ginger or you can strain the tea and drink it. Regular intake of this ginger tea will help you to get relief from the nausea and morning sickness. Take teapot and pour water in it. Place it on the stove over medium heat and allow it to boil. Add ginger root which is properly washed and sliced in this water. Stir it well and turn off the heat. Then add fresh lemon juice and honey in it. Mix them properly and drink this to get rid of morning sickness. Regularize the habit of taking this ginger tea to clear the morning sickness completely. Ginger capsules which are taken in the form of ground ginger in about 250 mg capsule for 4 times a day on daily basis. Then you will see improvement in the symptoms after 4 – 5 days for morning sickness. Always remember to buy ginger capsules which are regulated by U.S. Food and Drug Administration (FDA) and avoid mixing it with other substance as they might cause harm to the body. But make sure to consult your doctor before using ginger especially in capsule form why because this may interact with your regular medicines and cause some side effects to you. However the ginger is the best natural medicine for treating morning sickness, but it might also have some side effects, if not used properly. Never ever take aspirin for 2 hours after drinking this ginger tea why because both ginger and aspirin are blood thinners and cause some side effects on the body. While drinking ginger tea, you have to consume this warm but not hot or cold to grab the benefits that obtained from it. Avoid drinking ginger tea for more than 2 – 3 times throughout the day. Restrict 1 cup in the morning to get relief from gastro-intestinal disorders like heartburn, belching, indigestion, acidity, etc. Pregnant women who are suffering from gallstones and diabetes should not take this ginger tea to prevent the side effects caused by it. Its better that not to eat more of ginger biscuits, as these generally contain a lot of sugar with less amount of ginger in it. The best form of taking ginger is to take it fresh rather than dry, powdered, candies, tincture, ale, lozenges, ginger bread or cookies, capsules or any other forms to get the proper benefits for preventing morning sickness. Remember that there is no fetal risk that linked to using ginger during pregnancy, but few women has reported that there are experiencing heartburn or acid reflux. You can also use ginger Altoids which you can order online to ease the morning sickness and other stomach related problems. It may reduce the blood pressure which in turn causes irregular heartbeat. So the pregnant women who are suffering with low blood pressure should have to avoid taking it. Make sure to consult your healthcare provider or gynecologist before using this ginger herb for treating your morning sickness to know all about the dosage, timing and the forms of ginger to take, so that there should be no side effects. Although ginger is used to cure morning sickness but its must to consult your doctor to know whether you can take it or not why because it can cause some side effect if you’re suffering with some other health issues. This is all about Ginger and Morning Sickness. Hope you liked the article and give a trial for clearing your morning sickness problem or you can suggest this to your loved ones those who are pregnant. Quash your pregnancy blues with some amazing recipes. But don’t forget to share your experience with us. Am 7 weeks pregnant and morning sickness had become worse. It was so uncomfortable and after reading this article yesterday I tried ginger tea immediately and I got relieved. It worked for me and I recommend it to others expectant moms who may be experiencing the same.